Winterground Fairlands - A World Of Funmagineering! : EPROMs part 2: Success! NOTE: This article was originally posted over at the Interlock blog. This is a continuation of a previous article. 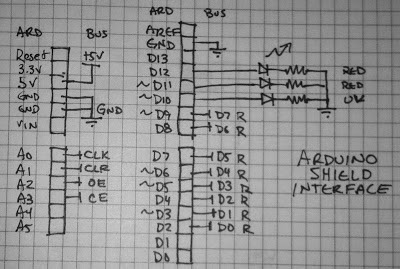 Quick summary: I tried to build a device for dumping an EPROM via Arduino, and I constructed a device that had no chance of working. Oops. 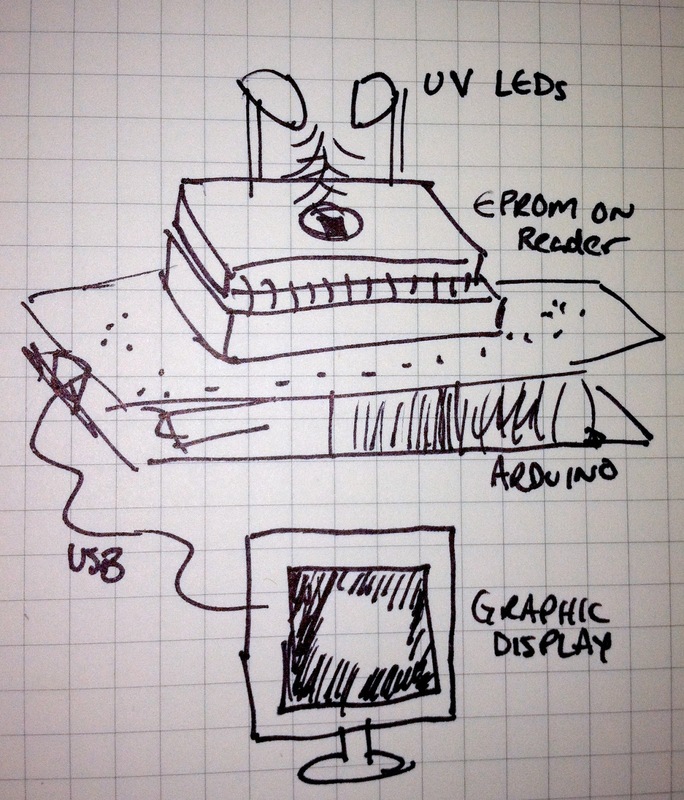 To summarize the overall project; I want to build a device that will illuminate an UV light-erasable ROM (EPROM) device, and also dump out its contents. I will then take the contents, display them as a graphic, and animate them over time as the bits fade away into an erased oblivion. AMAX consisted of software you run that emulated the Mac's hardware, as well as a "cartridge" that plugged into the floppy drive port of the Amiga. 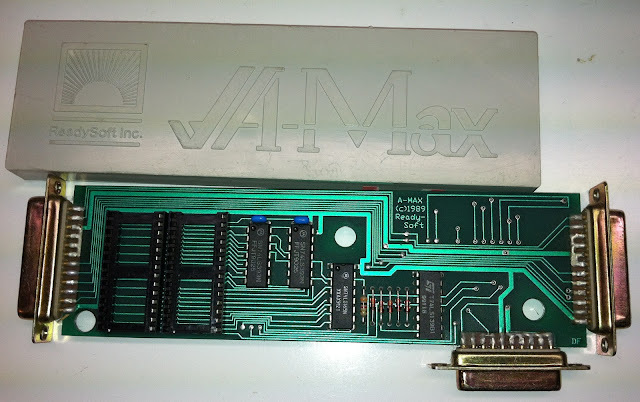 I remember hearing that they went with the floppy drive port because it was the only appropriate port identical on all Amigas that were available at the time. (Amiga 1000, 500, 2000). The other function of the cartridge was that you needed to plug in Mac roms into it, which the software would read in as it starts. Rather than storing the ROM on the Amiga, this protected the copyrights or whatever. But the important thing here is the function. I had picked up a few AMAX cartridges for $2 apiece at the awesome Active Surplus on Queen Street in Toronto a bunch of years back, so I dug one out. 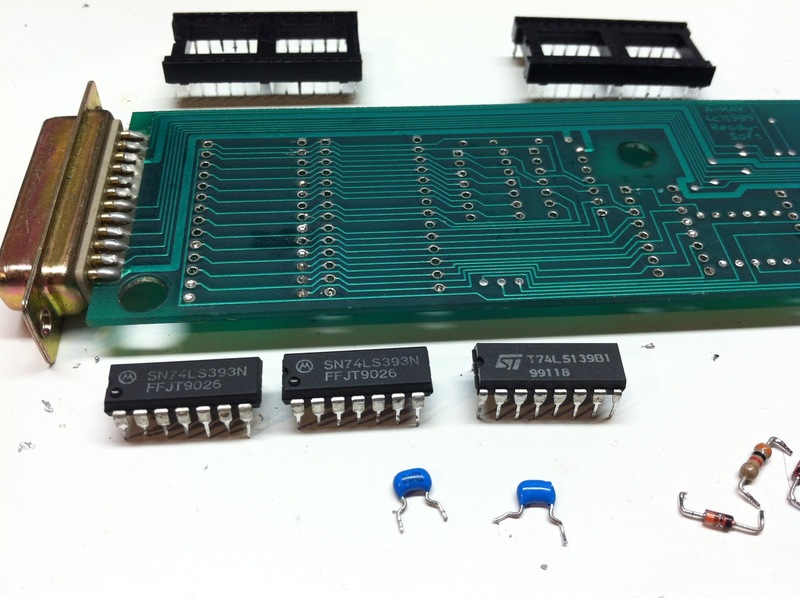 Left-to-Right, you see: Amiga D23 floppy connector, for connecting it to your Amiga, two 28 pin rom sockets, two 74LS393s, one 74LS165, a resistor, some diodes, a 74LS139, the Mac D19 floppy connector on the bottom, then the Amiga D23 floppy connector for adding additional Amiga floppy drives. 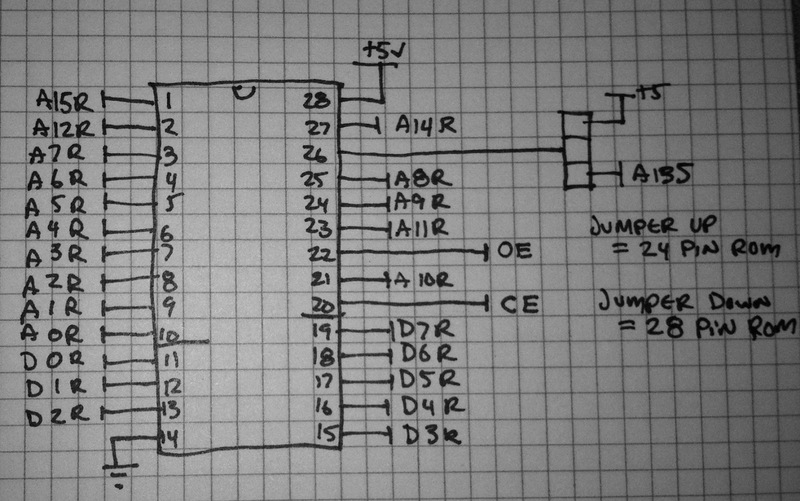 I've started to trace out the circuit, but it became obvious quickly that it was optimized for board layout rather than what I would consider to be a sane arrangements of data lines. 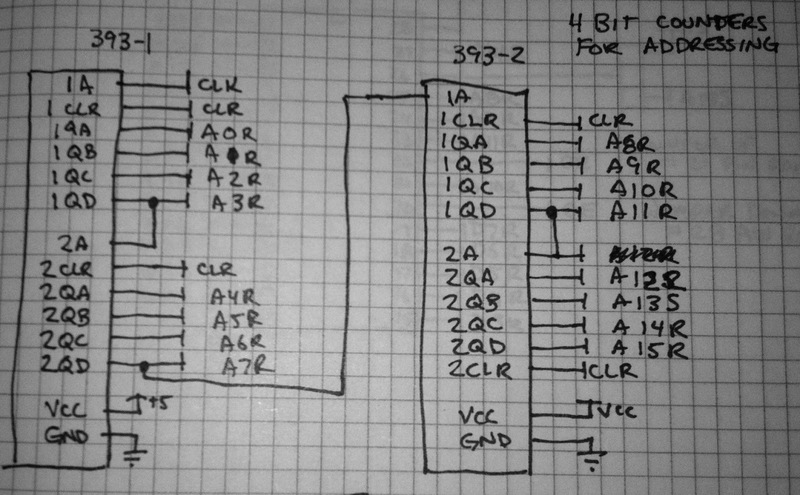 For example the 8 data output lines of the ROMs go into the 74LS165 PISO shift register out of order, so they need to be reshuffled once captured in the host computer. 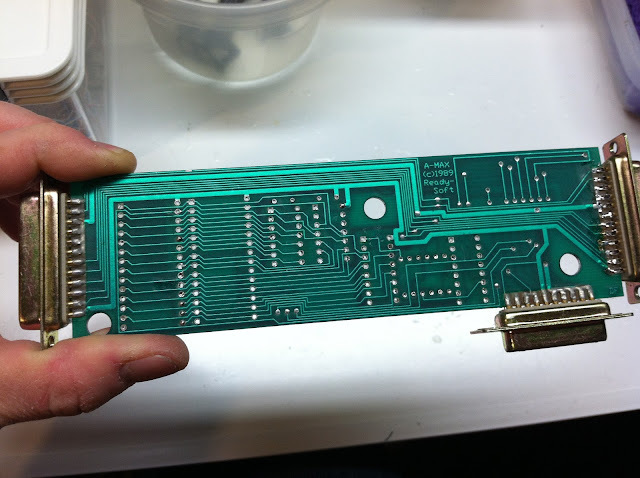 For fun, here's the board with no components on it. With a slight change in gears I can adapt my design to use the parts I now have in my toolbox thanks to my desoldering tools. 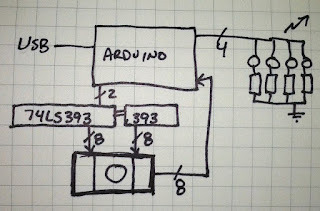 Instead of the Arduino shifting out an address, it will instead do the process described above. It will first clear the 393s, then alternately cycle between clocking out a pulse to increment their values, and reading in the value directly. 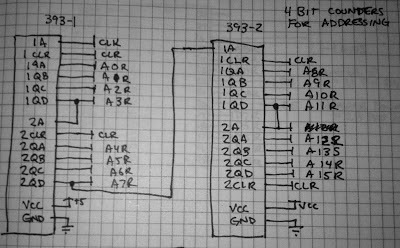 Since I'm accessing the ROM data from start to finish, sequentially anyway, this solution works out perfectly. 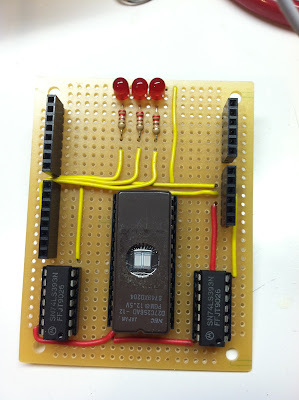 I also show four LEDs in the above diagram. Three for various status, one for UV illumination. Here is a close up of a 27C128 part. This one has Pac-Man programmed onto it... of course. 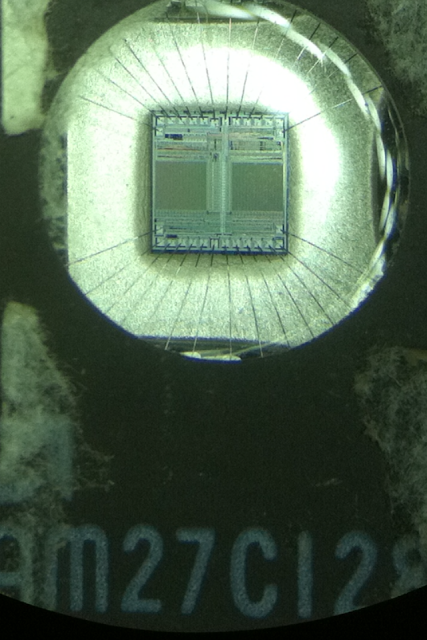 You can see through the quartz window, and down onto the EPROM silicon itself. Here are the two 74LS393's. You can see their connection to the address lines on the ROM, as well as the cascading of the counter, e.g. from 1QD to 2A, and from 2QD to 1A on the second chip. 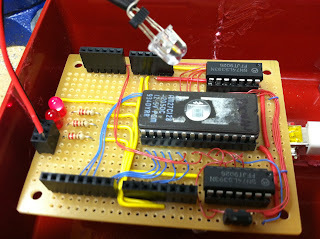 And the wiring for the 28 pin socket, including the 3 pin (two-way) jumper so that i can use smaller 24 pin parts as well. About the UV illumination... 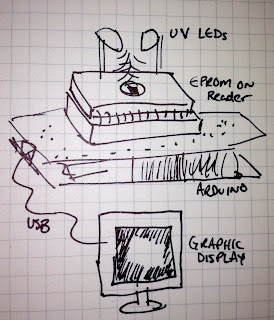 The data sheets for the EPROMs show that they should be erased with 253.7 nanometer light, at 15-20 minutes, 2.5cm distance at 15 Watt/seconds per cm^2. 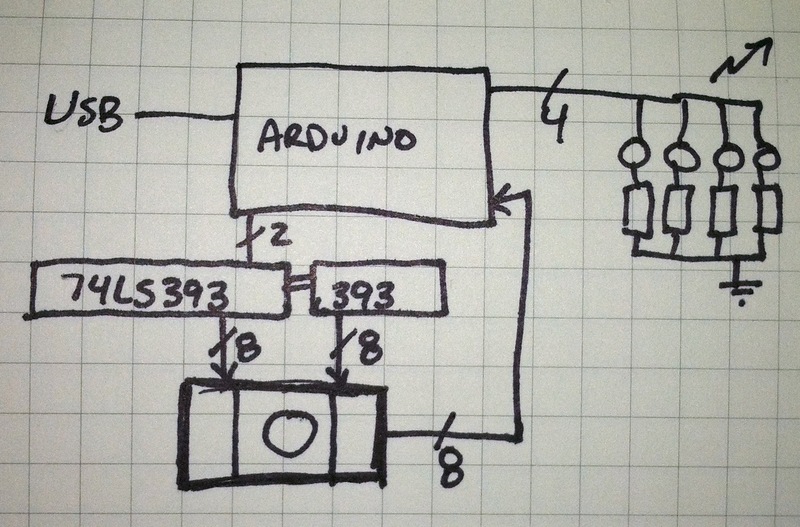 I dont know how to measure this with respect to LEDs, but I'm going to just wing it and see what happens. The sheet also says that 253.7nm is the optimal wavelength for erasing them, but anything below 400nm should work. 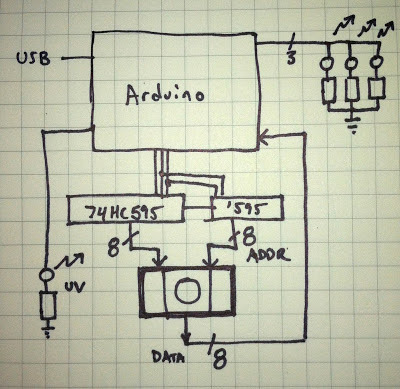 I believe the UV LEDs I have are somewhere between 350nm and 400nm, so it should work. The other issue is that the LEDs are substantially less powerful, probably a tenth to a hundredth the power. We'll see once we get this going, but I expect it will take on the order of weeks to erase a rom, rather than minutes. 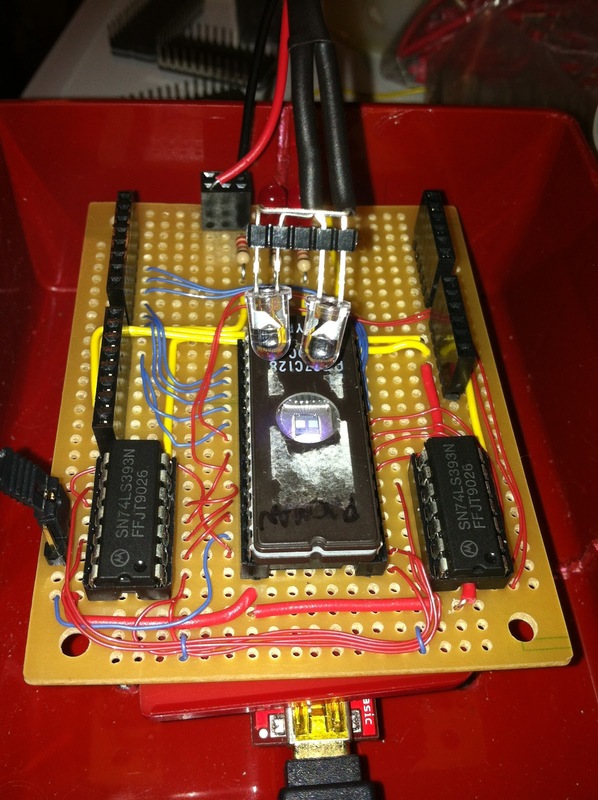 The good thing about this project, in comparison to using EPROMs functionally, is that you want speed of erasure for functional use. I personally found that my eraser worked on most of the devices I own in about 10 minutes. 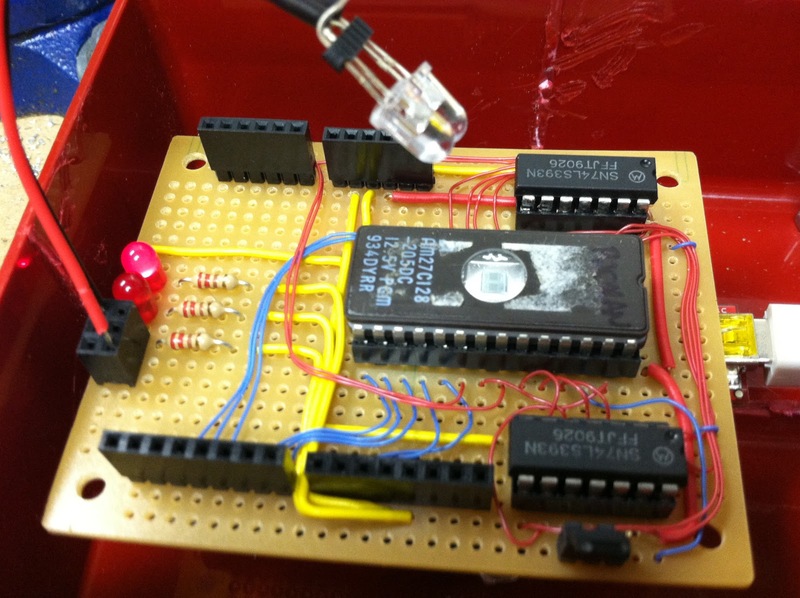 I would often have a chip or two in the eraser, while programming and debugging others. It worked out fairly well. For this project, it's completely okay if it takes on the order of hours to erase a device. I'll find out how well it works once I get it going. I may use more than one LED just to speed it up a little, in case it takes on the order of days instead of minutes or hours. I started laying out the board at home, wiring in just the LEDs, and figuring out the best layout for the chips. 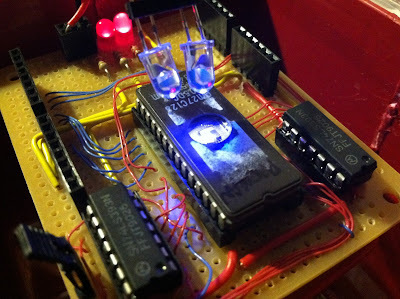 I used the DIY shield for Arduino from AdaFruit.com as the foundation to build this upon. 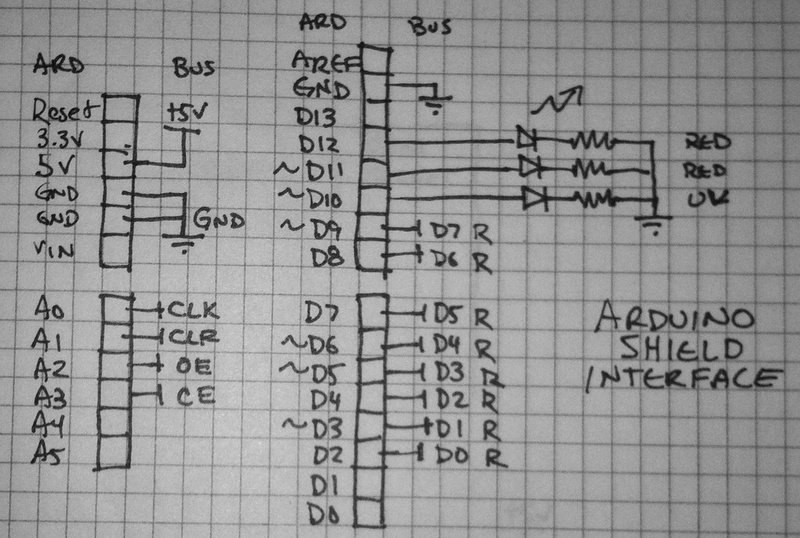 I wanted to leave space for possibly using larger chips in the future, so what is the bottom of the board here has space for a few extra data lines if i re-route that red power line. The '393's are layed out so that the one on the right, which addresses bits A0-A7 has four of its lines directly lined up. This was to try to make it a little easier to wire up. On the two images above, you can see a jumper on the left of the first image, bottom of the second image... this changes what one pin is used for. For smaller EPROMs, pin 26 of the 28 pin footprint is used for VCC, powering the chip. In the larger packages, VCC is moved to pin 28, and pin 26 is used for Address line 13. It's confusing. 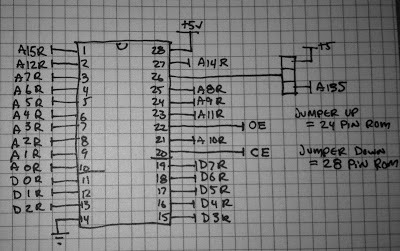 A table that shows all of the pinouts doesn't really help too much, but it was necessary so that I could figure things out for wiring it up. Next is firmware. I wrote a pretty simple program for the Arduino that simply enables the EPROM, resets the counters, then clocks through the addresses, reads them in and sends that data down through the serial link. After getting the enable lines wrong (active low, rather than active high), I managed to get it spitting out actual accurate ROM contents. As you can see in the above, it read out of the ROM (right half) 0xf3, 0x3e, 0x00, and so on. In a disassembly of Ms PacMan on the left, you can see these bytes in cyan, just to the right of the red numbers 0000, 0001, and so on. I've now had this running for 12 hours with no change in the bits at all. I'm thinking that it will require running for upwards of a week or two to have any affect on bits. 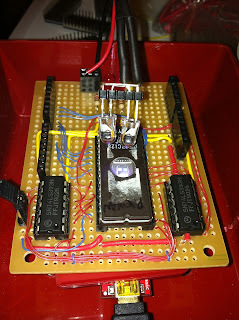 I may need to just drop the Arduino and ROM shield into my eraser to get the results I'm looking for... or at least a "control" to prove that the idea has a chance of working from here. 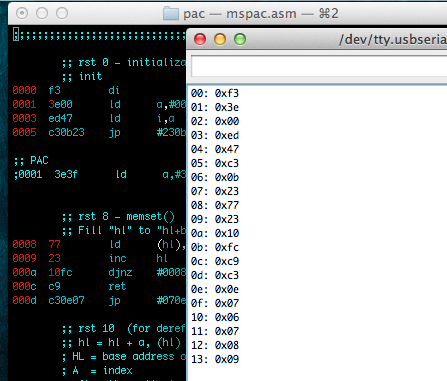 If nothing else, I now have a way to read EPROMS from an Arduino. Awesome! Repairing a Digital Camera: Battery Explosion!